In the Yucatan Peninsula of Mexico there are ancient underground caves where travelers can explore quiet pools and mellow rivers. These underground caves are known as Cenotes. 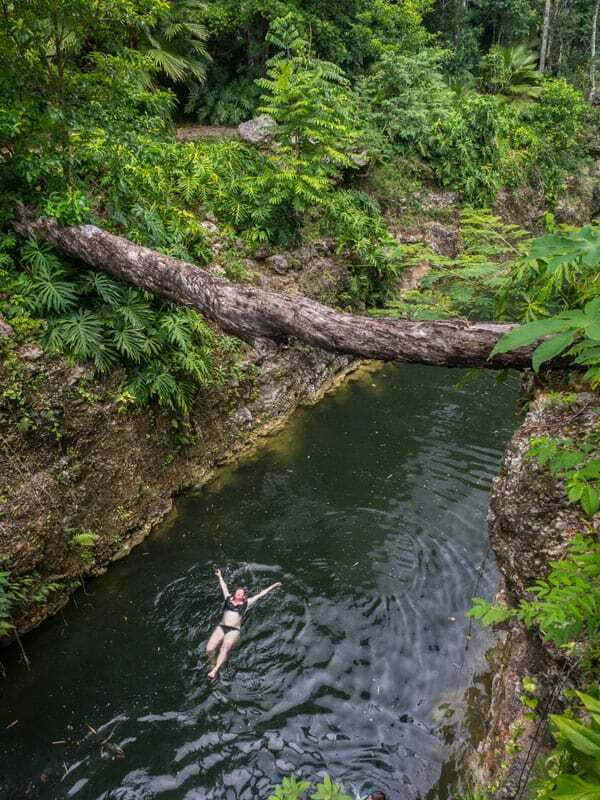 There are several ways to explore cenotes and we decided to make it a day of adventure. 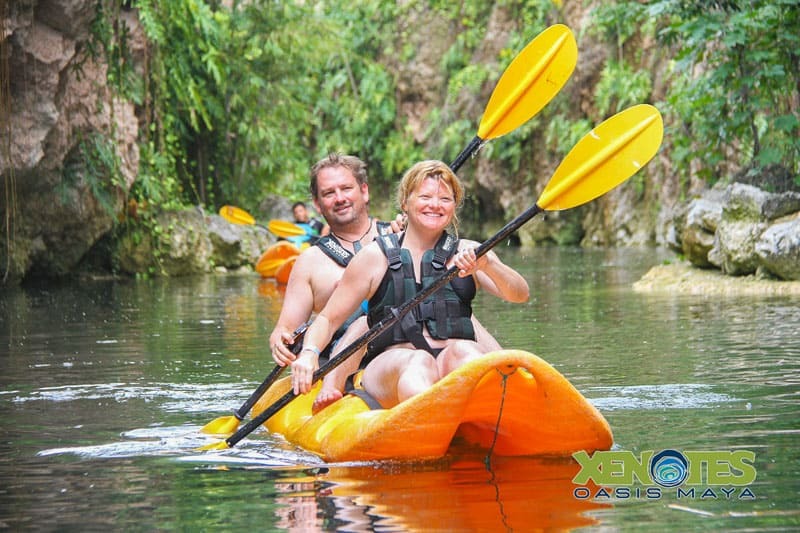 Viator Travel offers a cenote adventure tour and that is exactly what we've always wanted to do. We had seen people rappelling and ziplining into dark caves in Mexico and we wanted to try it ourselves. 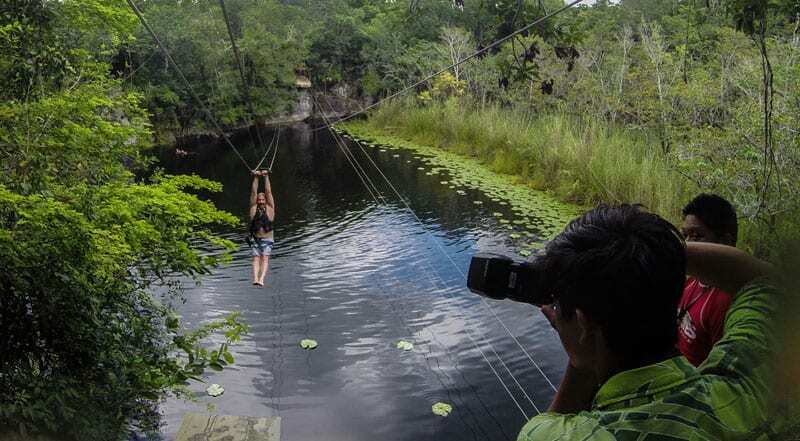 This was the perfect adventure to satisfy our desire to explore cenotes but also have some fun and adventure too! Like nearly every tour we've ever taken in the Yucatan area we had a long drive. It was about two hours to our first Cenote, but it was well worth the trouble. 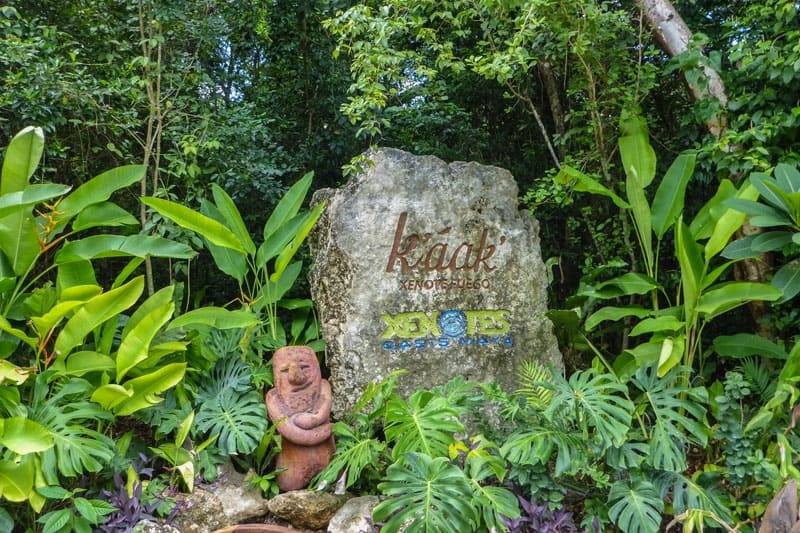 Going deep into the jungle, we visited four different Cenotes representing the four elements, water (Ha’ ), fire (K’aak), wind (Lik’) and earth (Lu’um). 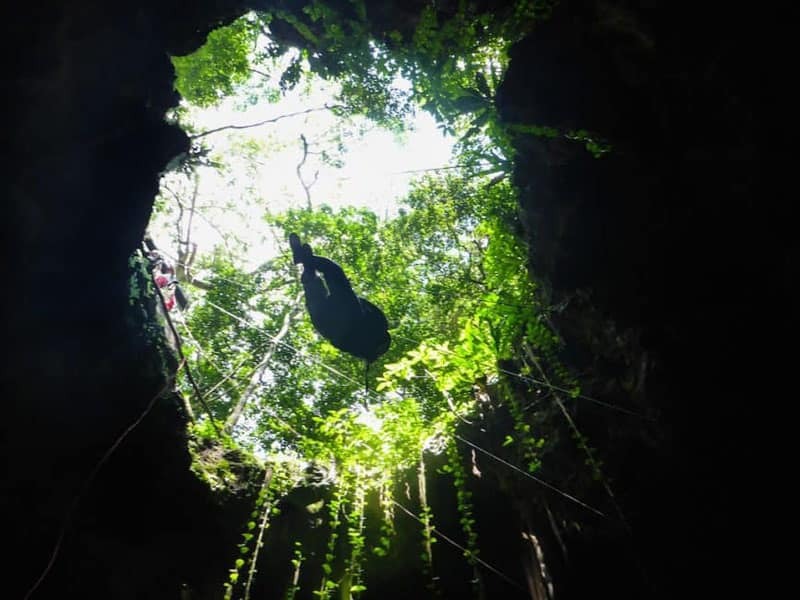 We started our tour at Lu'um Cenote where we rappelled into a giant dark hole. I was more nervous about the cold water than the fear of being lowered into a cave. They told us that the water was cold. According to our guides, it was the same temperature of the water in the obligatory shower that we had to take beforehand which was freezing! I stood under the faucet for as long as I could to acclimate to the cold. 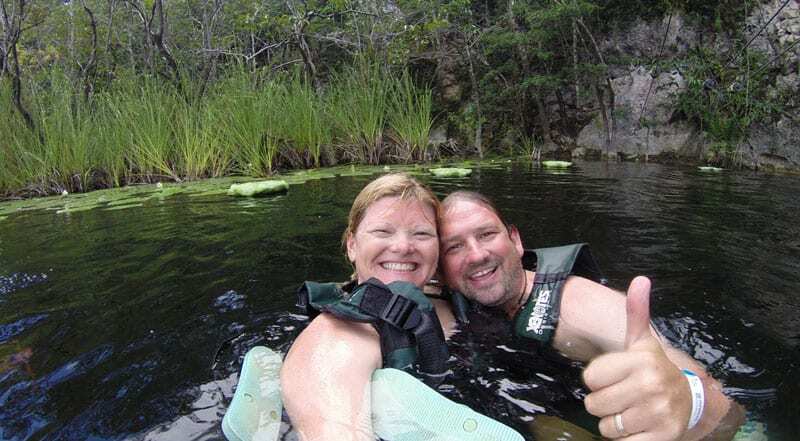 It turned out I didn't need to because the water in the Cenote was quite comfortable for these two Canadians. 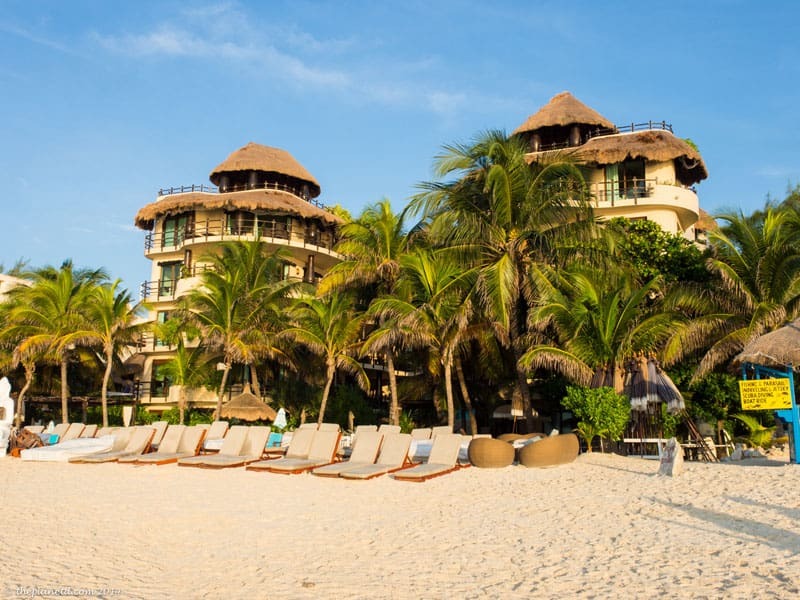 I guess what is cold to locals in Mexico is balmy to a couple Canucks. The zipline was fun, but swimming inside the cavern was better. It was beautiful exploring the limestone ceiling filled with stalactites. 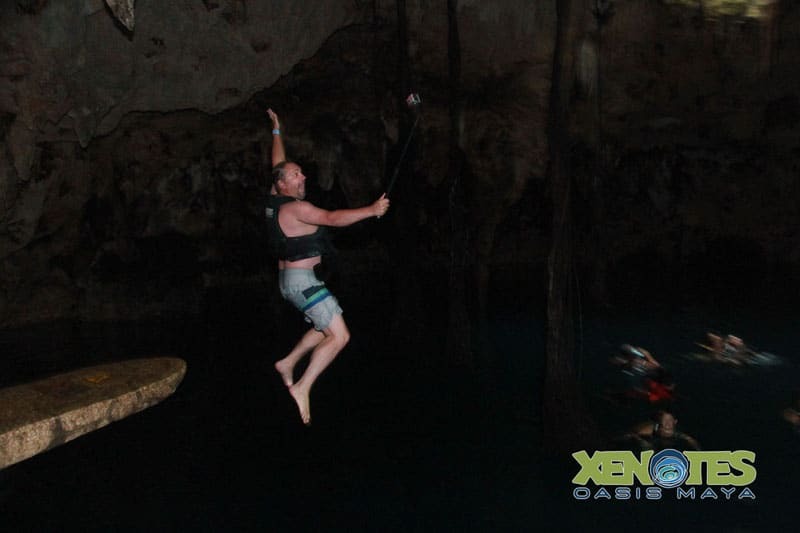 We were given a good amount of time to swim and jump off the platform for another quick thrill, but it was time to move on to cenote and adventure number 2! 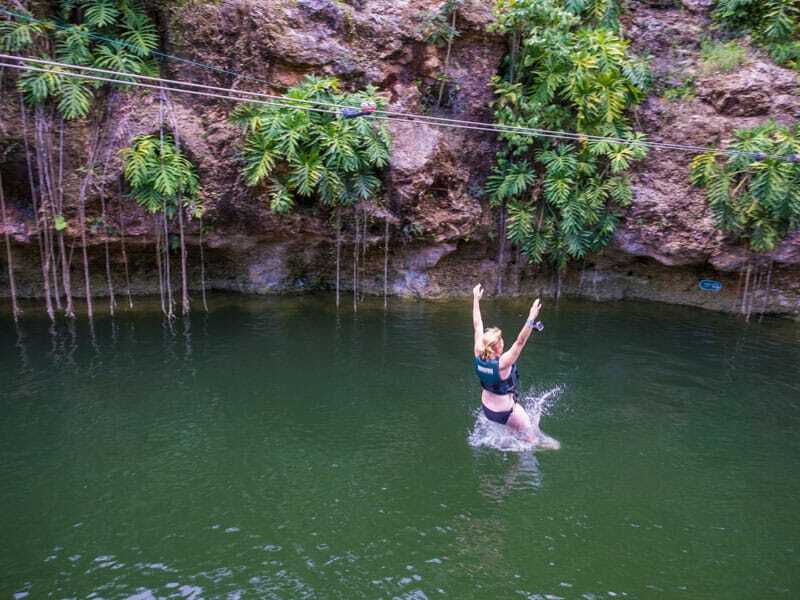 Our next cenote adventure took us to a zipline where we leapt from a platform and whizzed over an open pool before landing in the water. Ha' Cenote doesn't have a ceiling, it is completely exposed so we had the chance to fly right over it. Zip lines were going from either side and our guides let us go as many times as we liked. We could sit on a rope chair or hang from a bar, it was up to us. If you are looking to find your inner child again, this is the way to do it. At first this cenote didn't seem like much. We put on our snorkels and swam through a semi open cenote. There wasn't much to see in the water but once we got to the covered cavern things got more interesting. The swim was nice, but it was once we got out of the water and proceeded to the kayaks that it became amazing. This long river surrounded by high cliffs on either side was absolutely gorgeous. We paddled through the jungle on either side high above our heads and the greens were so vivid it took our breath away. Dave and I were last in the kayaks and we took our time letting everyone go ahead rounding corners before us. We felt as if we were all alone in paradise. We imagined that at one point in history, this was all underground, but as the limestone ceilings collapsed, they became open rivers in a deep canyon. Our final Cenote took us to another beautiful setting. A fully exposed pool with a long estuary leading away through the jungle, we entered it by hanging on to yet another zipline, but this time we had to let go of the line and fall plunge into the pool. Unlike Lik' we didn't land in the water, it was up to us to let go and fall. What a thrill! 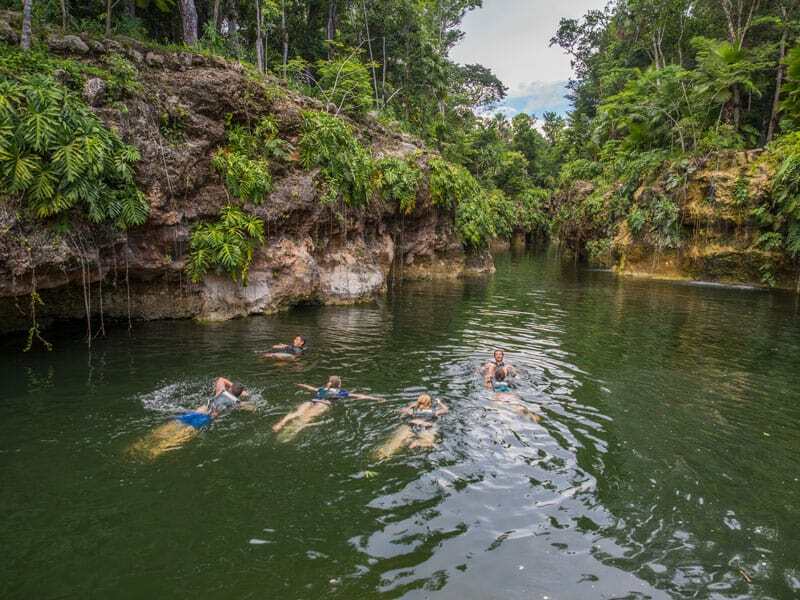 After our zip adventure, we took a swim to the waterfalls and enjoyed the water cascading over our shoulders before a leisurely swim to the end of the line where we could relax on inner tubes and watch people jump from the cliff. Dave decided to take photographs of this adventure and walked across logs spanning the long cavern. I swam on my own and chickened out of making the cliff jump. You all know me with water, it was enough for me to get up the nerve to let go of the zipline from above and plunge in the pool, forget about jumping from 5 meters! We really enjoyed our day exploring cenotes. Our tour operators ran a smooth operation driving us from one cenote to the next. We never felt rushed and we never felt that we overstayed our welcome at others. Everything was just right. They gave you everything you needed. We picked up our life jackets before each adventure, and they even had straps where we could fasten our flipflops to our pfd. We even had a delicious lunch where we made our own sandwiches, had some hearty soup and salads and they even offered beer and wine and at each stop we had access to fresh bottled water, coffee and snacks. Who could ask for more? We were back at our apartment with plenty of time to enjoy the evening and left our day satisfied with seeing beautiful caves and rivers while having a high flying adventure over Mexico's fascinating Cenote system. « 5 Puglia Food Tips – When All Else Fails, Mangia! 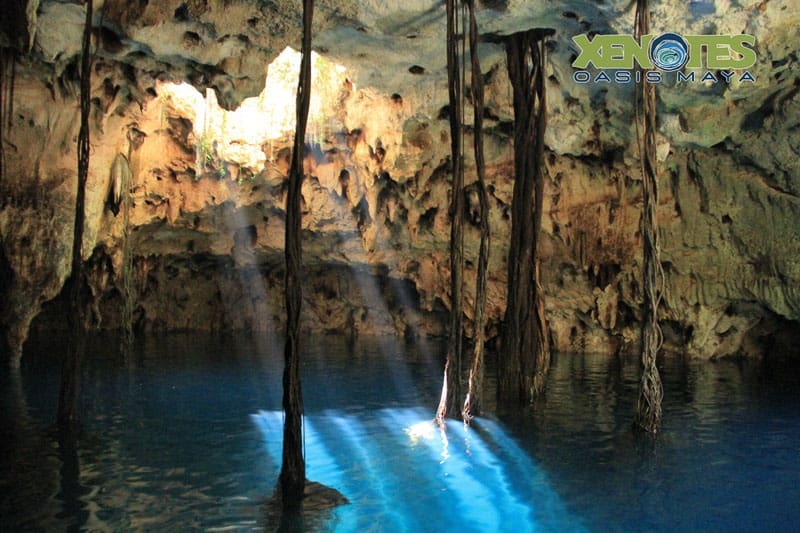 7 Responses to "Remarkable Cenotes: An Underground Adventure in Mexico"
These places are stunning with such a beautiful vegetation and clear waters. My favorite is the green Ik Kil Cenote at Chichen Itza. Good on you for letting go of that zipline Deb, but I’m with you not jumping off the cliff! No way for me either. I couldn’t get enough of those gorgeous cenotes in the Yucatan, so many to explore. I think I liked Cenotes better than the beach! Is that weird? 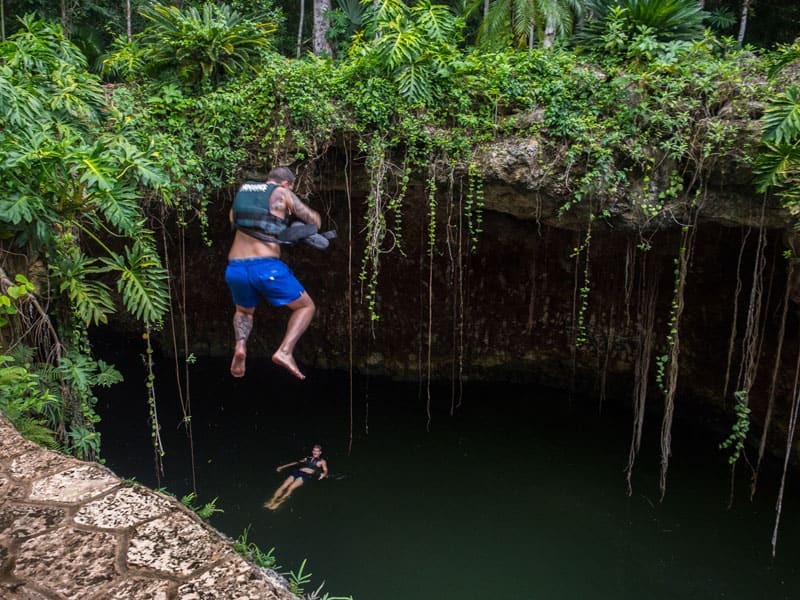 Wow talk about a comprehensive travel guide, great work and nice pics you must be crazy to leap into a cenote like that!! Beautiful photos! This looks like an amazing adventure trip to make beyond the beach! Thanks for sharing!